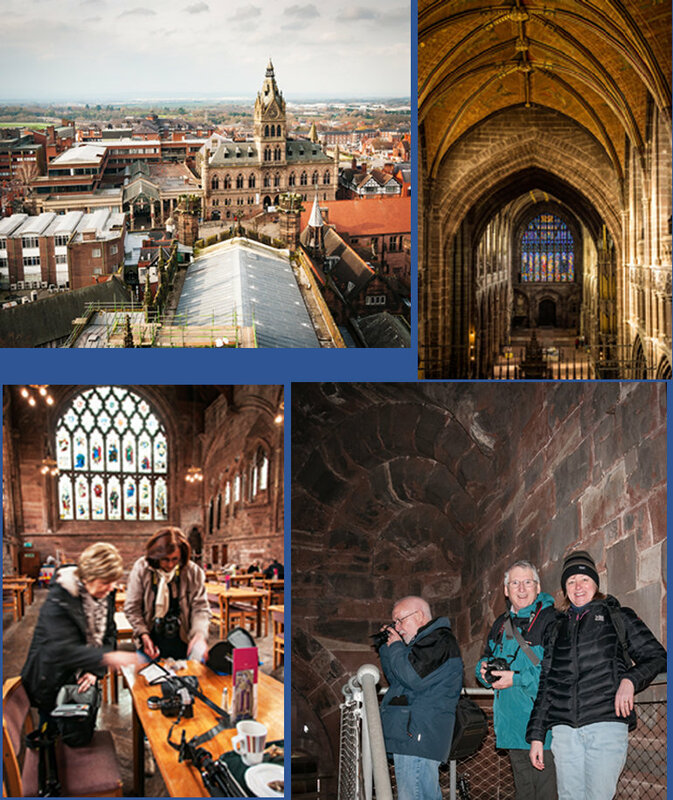 MID-CHESHIRE CAMERA CLUB: MCCC Visit Chester Cathedral with Crewe P.S. On Saturday 13th February, MCCC and Crewe P.S. joined forces to make up a group of 12 for the Chester Cathedral Tower Tour. We had our own nimble tour guide who led the way up a series of narrow spiral stair-cases to the top of the tower. We followed carefully and slowly up the 216 steps, climbed a short but steep ladder, negotiated very small doorways, narrow passageways and high walkways. But the effort was really worth it. Quite apart from the views at the top of the tower which in fairness were rather hazy, we stood next to the original cathedral bell, visited the former ringing chamber, walked along the upper galleries and peered down on the fourteenth century quire stalls and Victorian organ. This tour was definitely not for the faint-hearted or the unfit but it was a great chance to see and to photograph this beautiful ancient cathedral from a completely different perspective. Once we had climbed back down it was time for a coffee and cake in the cathedral’s spacious café, before exploring the many photo opportunities at ground level.